We have great pleasure to introduce ourselves as Pharma Human Resource Consultancy. The name itself signifies that we are focusing in an area of exclusive pharmaceutical segment. We provide and recruit suitable Human Resources to pharmaceutical companies across India. Pharma Focus is one of the best Recruitment solution for its clients and striving for excellence with business interests across PAN India. Pharma Focus team comprises of result oriented Consultants who are specialist of their domain. Our people are the most important asset since every team member is well trained and well groomed to suit the Market trends and need of the day. We deliver talent through our people and most significantly working closely with the clients. We provide man power in the field like Sales, Marketing, Product Management, Quality Control, Quality Assurance and Research & Development. Dr. Girish Telang is person having qualification in various streams like Pharmacy ,Engineering and Management. He is having experience in the field of Sales, Marketing and Training. He has worked in various capacities as Medical Representative, Area Manager, Regional Manager & Manager- Sales Promotion. 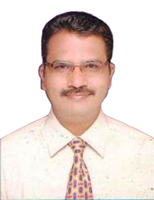 He has handled assignment of various traning programme in development of sales professionals.